I have been looking for meals that will please everyone, including Poppy. She is our little food vulture. She will eat anything you give her. She no longer is interested in the pureed foods, she wants what we are eating. I can’t say I blame her. Poppy will be 9 months old on Thursday (Where does time go?). She doesn’t have any teeth yet, but she loves food. Literally, there hasn’t been anything she doesn’t like so far. As long as it’s small enough and soft enough, she does just fine. Pickle, on the other hand, he is a little more pickier than her. He doesn’t really like things with sauce in them like spaghetti. Usually, if we can get him to try something, he usually finds out he likes it. That battle can be difficult though. I haven’t been so lucky in finding meals that are family friendly, that include babies. I thought maybe other people struggled to find these meals, too. Lately I have been wanting comfort foods (all the carbs). 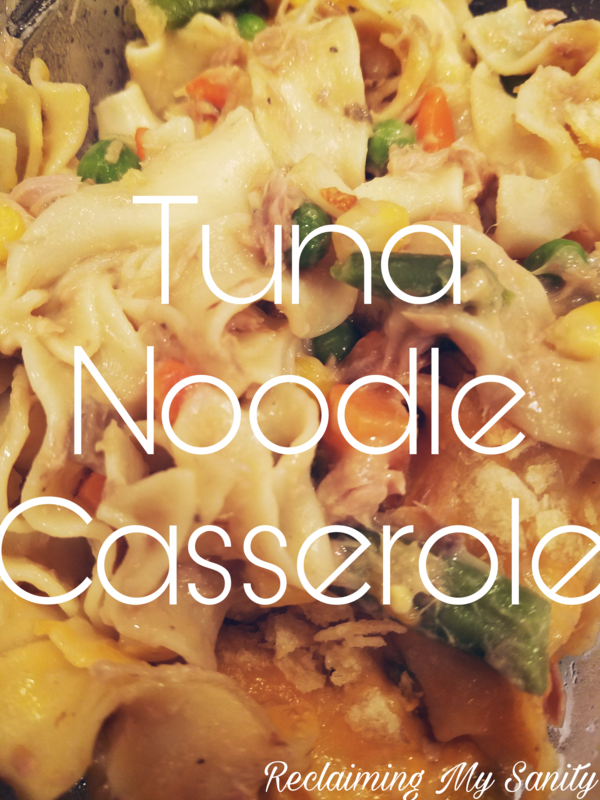 One of my childhood favorites is tuna noodle casserole. I decided to give it a try with the kids. Poppy had zero complaints and was searching for crumbs on the table. Pickle, well, he took a bit longer to convince. He sat there for a good 10 minutes making faces at his food, shaking his head, and picking through the noodles trying to find the vegetables that were in it. Eventually, he took a bite, a slow bite. He acted like it was gross, but barely had it in his mouth. He put the whole bite in his mouth and chewed. He decided it wasn’t so bad afterall. 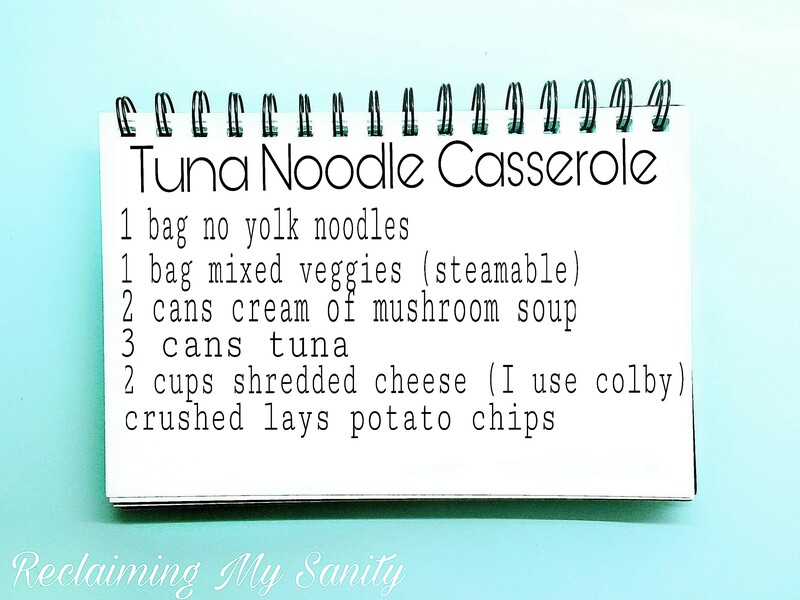 The meal itself is easy to make and doesn’t cost much. I made a whole 9×13 pan of it. Made enough for 4 adult helpings, 1 toddler helping, 1 nine month old helping, and leftovers for tomorrow’s lunch. 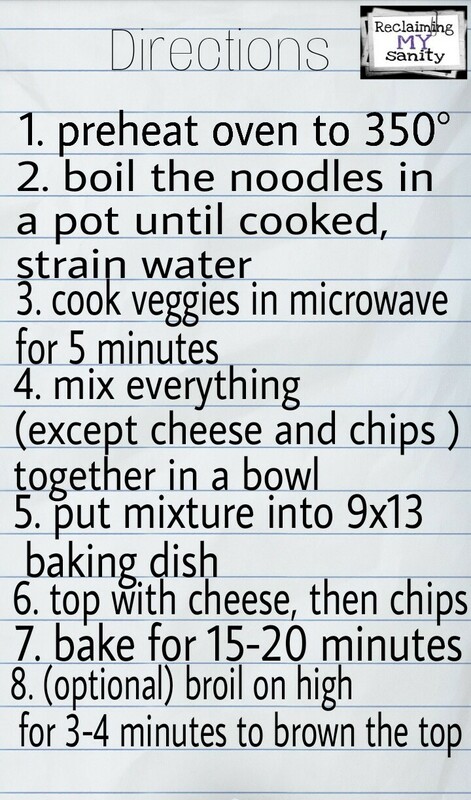 I thought I would throw the recipe in here for anyone who is interested. There you have it. So yummy! If you have any recipes that are family friendly, please let me know in the comments! Links are also appreciated! Yes! The mushy things work well!